What is true is that almost immediately after resigning, Bill regretted his decision. By the time August came round and the new season kicked into gear, Shanks was back at Melwood, training with the players, enjoying the camaraderie and the chance to put his boots on again. This put the players in an awkward position. Naturally, they referred to him as 'boss', a fact which automatically undermined the new man in the job, Bob Paisley. "I wasn't feeling ill or anything like that, but I felt though that if I was away from the pressures of Anfield for a while, and rested, it would make me fitter and rejuvenate me. I felt I could contribute more later on. I would never leave the city of Liverpool, and still wanted to be involved in football. I still wanted to help Liverpool, because the club the club had become my life. But I wasn't given the chance. I have a pension scheme and I had a testimonial, which was marvellous, an unforgettable evening, but I was willing to work for the club for nothing more than my pension. I was willing to help in any capacity, just to advise, if necessary, so that there would be no disruption at all while Bob got run-in." Liverpool Football Club, now cornered into an unenviable position, took the decision to ban Shankly from Melwood. It was a no-win situation for all concerned. The fans, not knowing the full details, heard only that Shanks was no longer welcome at the training ground, and rumours were rife that he in turn, had turned his back on the club and was looking for employment elsewhere. In a messy few months since winning the F.A. Cup, the club and it's greatest ever manager, looked to have fallen out with each other. "I went to the training ground at Melwood for a while. It is only down the road from where I live. But then I got the impression that it would perhaps be better if I stopped going. I felt there was some resentment - 'What the hell is he doing here?' I packed up going to Melwood and I also stopped going into the directors' box at Anfield. I still go to the matches, of course. I sit in the stand. I would have loved to have been invited to away matches, but I waited and waited until I became tired of waiting. "Finally after twenty months and after Liverpool had won the League championship again, I was invited to travel with the club to Bruges for the second leg of the UEFA Cup Final. I accepted, because I didn't want anybody to think I was petty, but it came too late for my peace of mind. I couldn't help wondering why it had taken them so long. And I was not impressed with the arrangements they had made for me in Bruges, where I was put into a different hotel to the one used by the official party. I found that quite insulting. "I might add that I count Everton amongst the clubs who have welcomed me over the last few seasons. I have been received more warmly by Everton than I have been by Liverpool. It is scandalous and outrageous that I should have to write these things about the club I helped to build into what it is today, because if the situation had been reversed I would have invited people to games. "It was never my intention to have a complete break with Liverpool, but at the same time I wasn't going to put my nose in where it wasn't wanted. Maybe I was a an embarassment to some people." 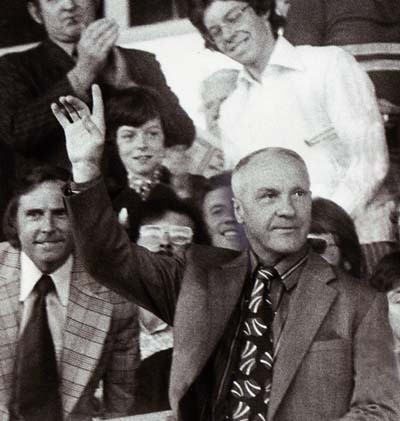 Bill Shankly spent his first Saturday afternoon in retirement watching his local home match, Everton - Derby County on 18th August 1974, seen here acknowledging the rapturous applause he got at Goodison. Liverpool were playing at Luton, where Bob Paisley showed he was no slouch in producing quotable quotes. Asked what Shankly was doing, he replied: "He's trying to get right away from football. I believe he went to Everton." If Liverpool felt they didn't need his services any more there were plenty of other clubs who did. He would be forever charging up and down the country looking at players and watching matches for a variety of clubs, as a favour. It wasn't uncommon for a manager to telephone Bill and ask his advice over a disciplinary matter or for his opinion on a formation or strategy. He was as much in love with the game as he had ever been. The natural reaction to all this is too blame the club. How could they do such a thing and treat him so badly? The obvious solution, so everyone thought, was to give Shankly a permanent presidential style role within the boardroom, an overseer or godfather position that would have ensured his continued presence at the club without undermining the role of his successor as manager, Bob Paisley. It was, of course, not so simple. Just a few years earlier, one of the great triumvirate of Scottish born managers, Matt Busby, had stepped down at Manchester United and been given just such a presidential style position at the club. The new manager, Wilf McGuiness, had to work with Busby's last team with it's creator peering ominously over his shoulder. McGuiness found this a burden rather than a help. There was confusion at the club as to who was really running things. Sir Matt still held all the influence, and it was he the board turned to when McGuiness was promptly given the sack shortly after taking charge. The rot had set in though, and United were relegated in 1974, the same year Shankly had announced his retirement. It would be a fair bet to say the Liverpool board had kept a watchful eye on events just down the M62 motorway. Bill had had a deep mistrust with white collar managers, stemming from his early days in Glenbuck where mine owners often put thoughts of profit before the safety of miners. Also, he had had run-ins with board members at most of his previous clubs, usually over money and lack of ambition. The impression was that his biggest reservation about directors though was their generally perceived lack of interest in the game. Liverpool maybe they never considered it feasible that Shankly would want a place on the board, no matter what label was put on it. Contrasting to that Shankly claimed he would have liked to have become a director on Liverpool's board. "It would have been a wonderful honour to have been made a director of Liverpool Football Club, but I don't go round saying, 'I would like to be this and that.' That's begging and I'm not a beggar! No, no, anything I have done and everything I have got, I have worked for." Bill also had a healthy respect for football directors, definitely not for the ones who were on Liverpool's board when he took over, but he later found men on the board who shared his vision. I shall always think back with special happiness to one particular period at my time at Anfield which represented everything I could have hoped for in the organization and running of a football club. That was when Eric Roberts was the chairman, Eric Sawyer, the financial director and Peter Robinson the secretary. We had a wonderful working relationship. I have worked for football directors and I have known many others. In the main, directors are genuine fellows, and it is not an easy job. They have to be discreet and they have to know what they are talking about. They have to have a knowledge of business and they have to have knowledge of the game. They are men of influence in the making of a successful football club. You need good players, a good training staff, all in tune with the manager, good directors and a good secretary." Shanks presented with a radio at the Vines pub in Lime Street. Living close to Bellefield, Everton's training ground, Shankly would often call in there and join in the training sessions, proving the point that many of his barbed comments about Liverpool's great city rivals were no more than psychological shots across the bows. Indeed he spent the first Saturday of the 1974-75 season following his retirement as Everton's guest at Goodison Park. He would talk to anyone about football, go anywhere to put his boots on again, because in simple terms, he just loved the game. It was a common sight to see him on Sunday morning's watching and encouraging the local kids playing in the Sunday league games in the park by his house. The park was later renamed 'The Bill Shankly Playing Fields'. Curiously, his retirement brought an unexpected insight to football too. He commented on how much he had learnt about the game in his first year out of it from looking at it through a different perspective. He had more time for his wife and family, but life wasn't the same without his involvement in football: "My life's changed completely and I've been bored a lot of the time. Before, I had somewhere to go and didn't have time to be bored. Now I've got time on my hands. I have done quite a few things. I've been to hospitals, made speeches and watched a lot of games. But not being connected with football in some capacity has bored me. I'll always be a Liverpool man. I never resented the club after I left, as some stupid person wrote in the paper. I was so proud of what Bob Paisley achieved after I left because we worked together for so many years and I was part of it." It is inevitable that a great sense of loss and a feeling of frustration should remain amongst Liverpool supporters that Shankly passed away without he and the club he so loved making their peace publicly. As is often the way in life, his death on 29th of September 1981 pricked at the conscience of those who had worked with him during his lifetime to finally recognise his achievements and the Shankly Gates, at the Anfield Road end of the ground were duly erected in his honour. Better late than never, though in some eyes, they remained an inadequate testament to the man who had dragged the club to the forefront of European glory until 4th of December 1997, when a statue of Shankly, sculpted by local artist Tom Murphy, was placed beneath his beloved Kop. 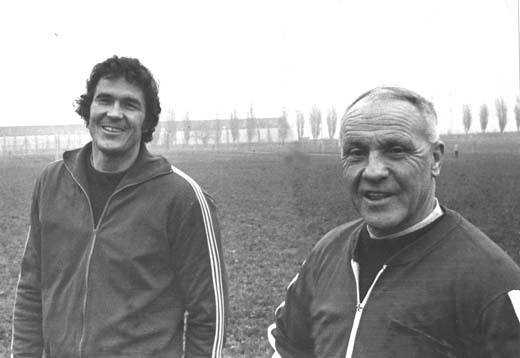 The legendary manager Don Revie was a good friend of Bill and knew how top flight football could wear you down: "His retirement was a great loss to the game, but I am glad he got out at the top. The pressures of managing a team like Liverpool or Leeds and keeping them at the top are tremendous." 'A working class hero is something to be'. He could not have imagined how apt an epitaph that would be to the man who outlived him just a few short months. Copyright - LFChistory.net - Article written by Arnie and Derek Dohren for Shankly.com - quotes from Shankly's autobiography "Shankly" published in 1977 (copyright John Roberts and Bill Shankly). Images are not owned by LFChistory.net and we acknowledge their copyright. "He would phone me up every Sunday morning. Each call followed the same ritual, with Shankly eulogising over his Liverpool players. Every player would be praised, including the substitute who would have contributed to the victory even if he had not played. To Shankly, every player in that red strip had everything; a right foot, left foot, tackling, heading and stamina. No player had a weakness, they were each the best player, position for position in the world. When I managed to get in a mention of one of my own players, he would just say, 'a fair player, nae bad,' leaving me wondering how Leeds ever managed to win a match with no great players, not even good ones for all that Bill would admit to."